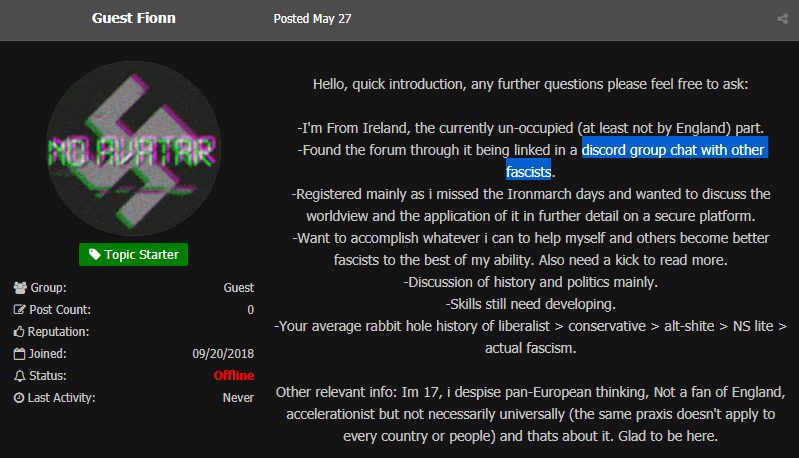 A rising forum that promises to follow in the footsteps of Iron March offers helpful — but unsettling — insight into fascist thinking and propaganda tactics. 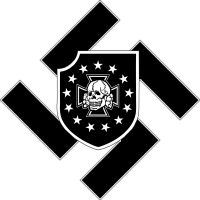 Below, I examine Fascist Forge, its members, and the dangerous threat it poses to public security. 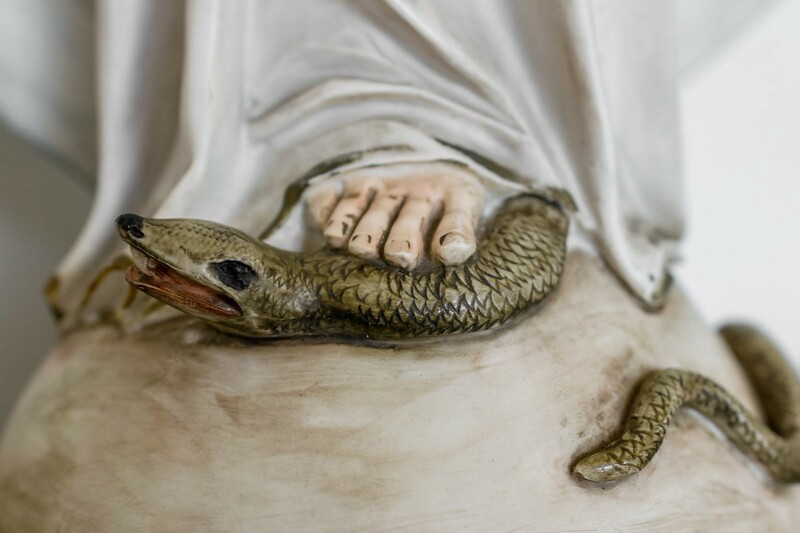 The Virgin Mary crushing the head of the serpent. 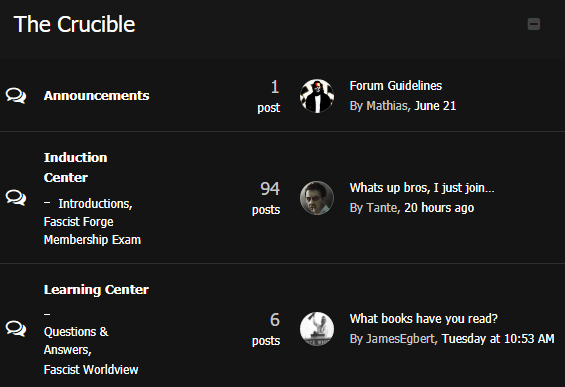 “The purity of our worldview is our highest ideal and we have zero tolerance for anything that opposes it,” Mathias wrote in a post dated May 9, adding that FF was intentionally “modeled after” the infamous Iron March website. “Our aim is to continue where they left off,” he wrote. 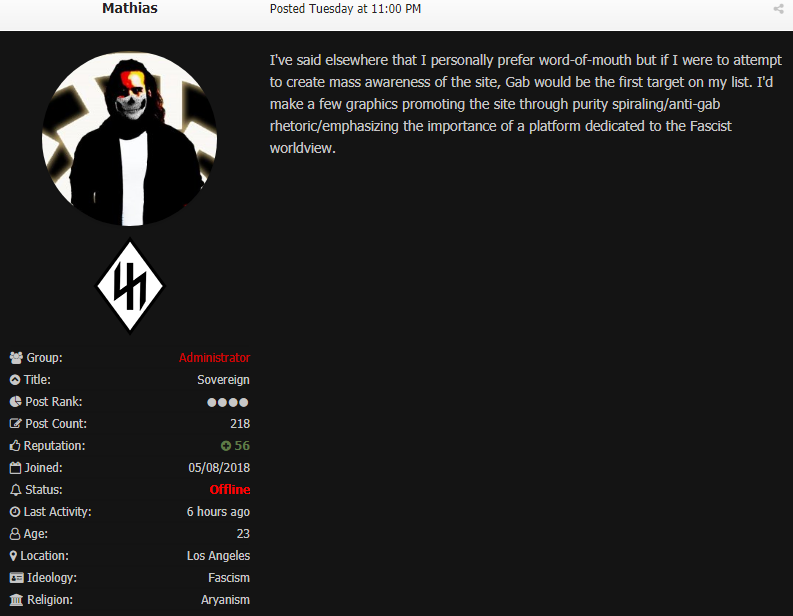 Mathias, the administrator of Fascist Forge. 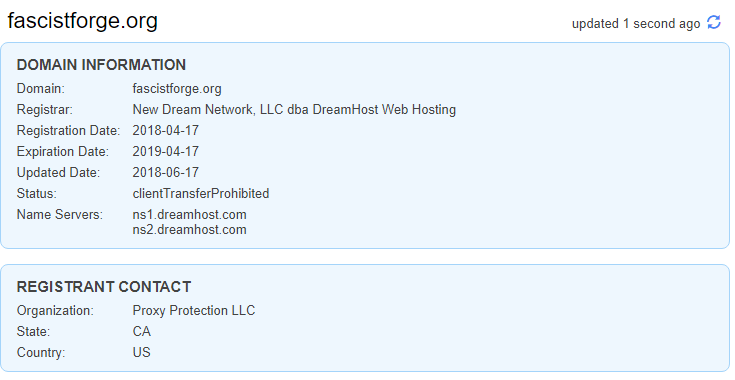 Twenty-two days before that post, Mathias registered FascistForge.org with DreamHost, a Los Angeles-based domain registrar. 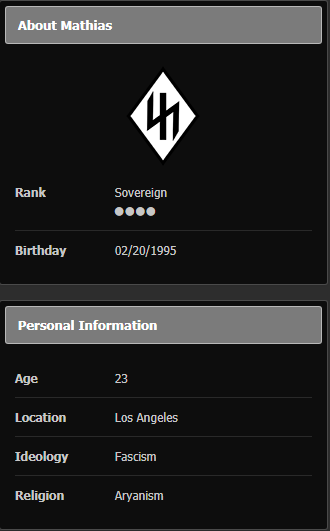 This is interesting because, according to his profile on FF, Mathias is a 23-year-old living in Los Angeles, California. 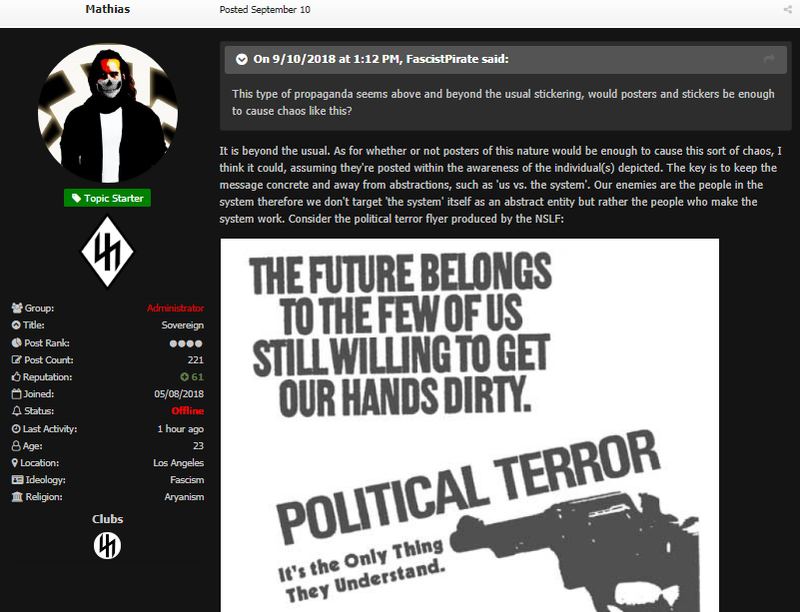 On the left: A WHOIS lookup for FascistForge.org via Whois.com. Note the state listed in the Registrant Contact section. 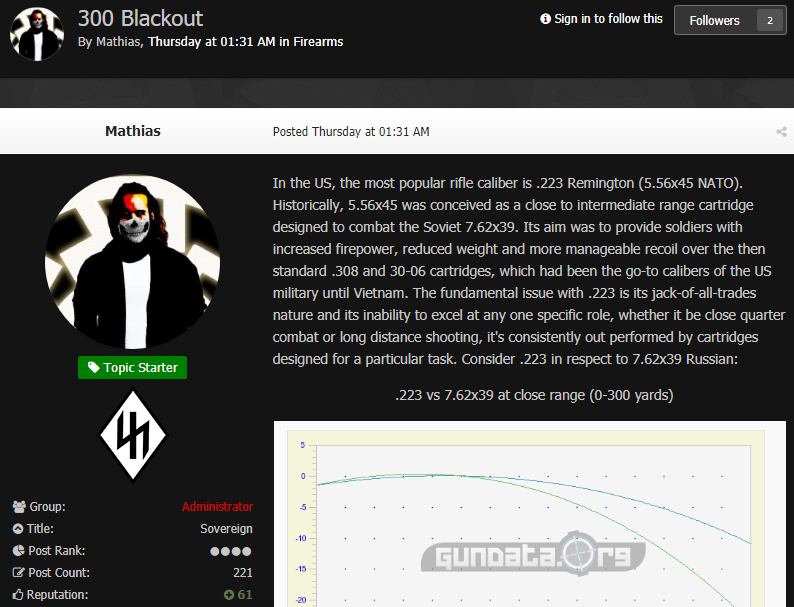 On the right: Additional information about Mathias courtesy of his Fascist Forge profile page. 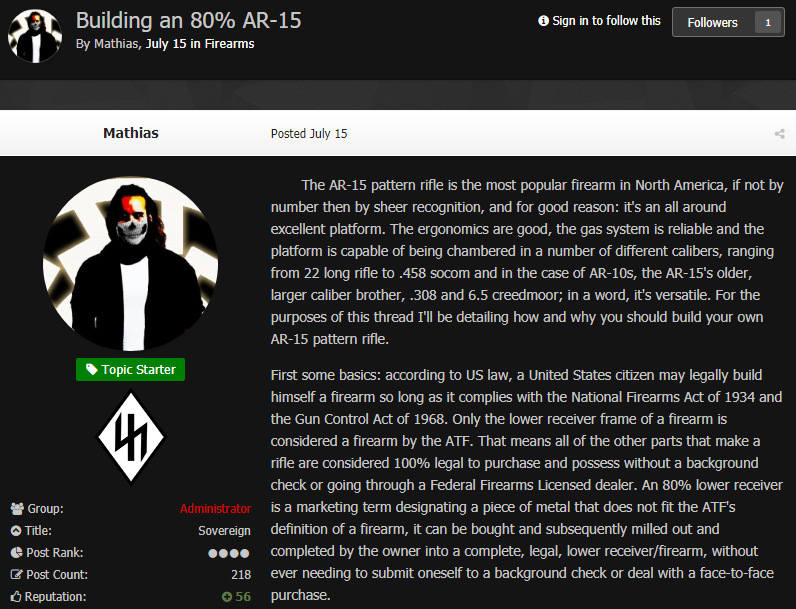 I first learned of Fascist Forge from a post in Gab’s notorious “Read SIEGE” group where potential terrorists share fascist literature, music, and memes, as well as Atomwaffen Division and Siege Culture propaganda. 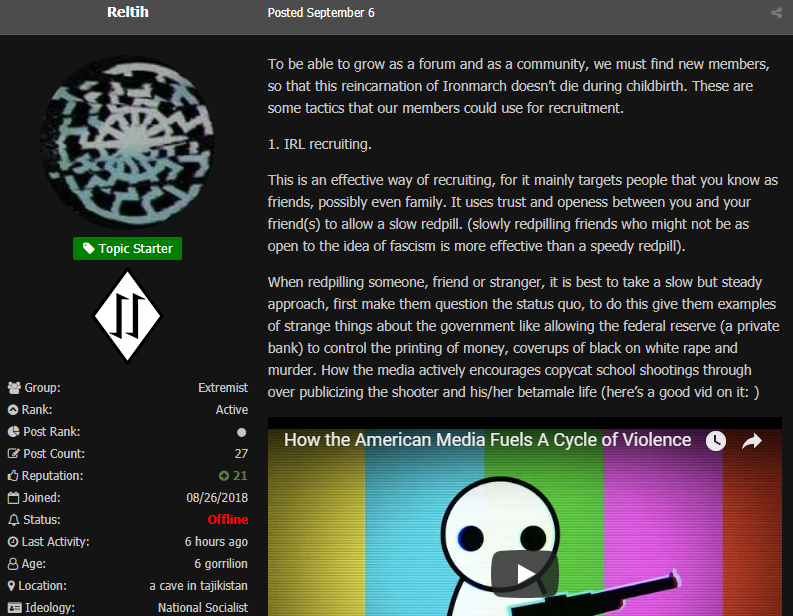 On September 17, Ordained Insurgency (@FountainOfAmmunition) shared a link to the forum and wrote that FF seemed similar to Iron March. Unfortunately, this post is no longer accessible. (It used to be located here.) 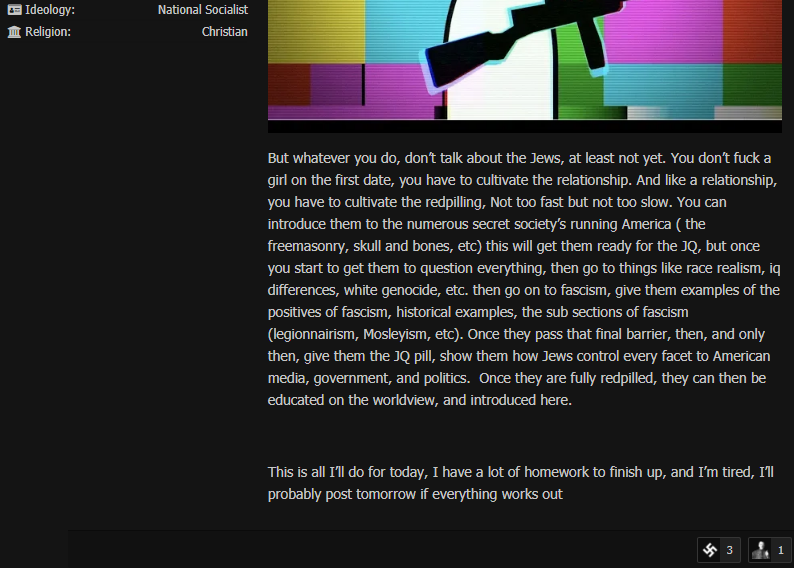 I don’t know if it was deleted by Ordained Insurgency, group admins, or by Gab, considering that the link leads to an odd error page. 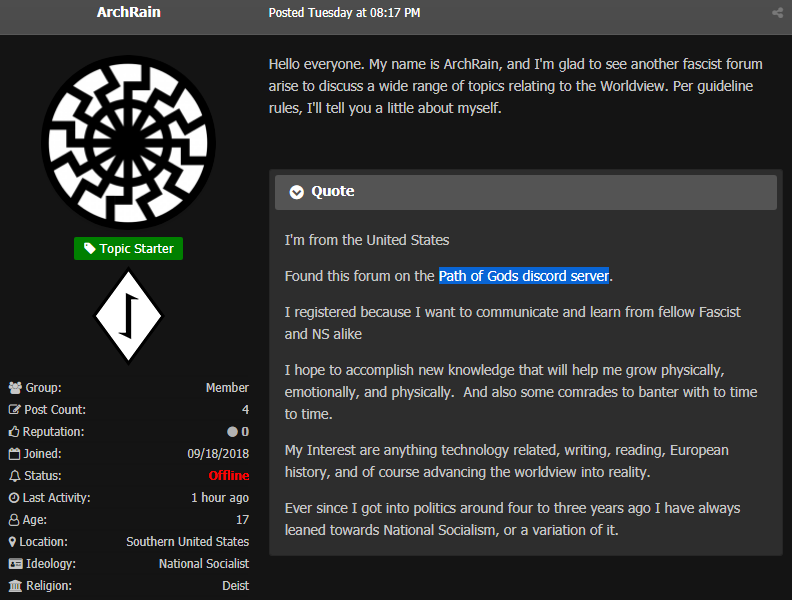 Furthermore, according to multiple introduction posts by members on FF, the forum has been promoted in fascist Discord servers, including a so-called “Path of Gods” server. 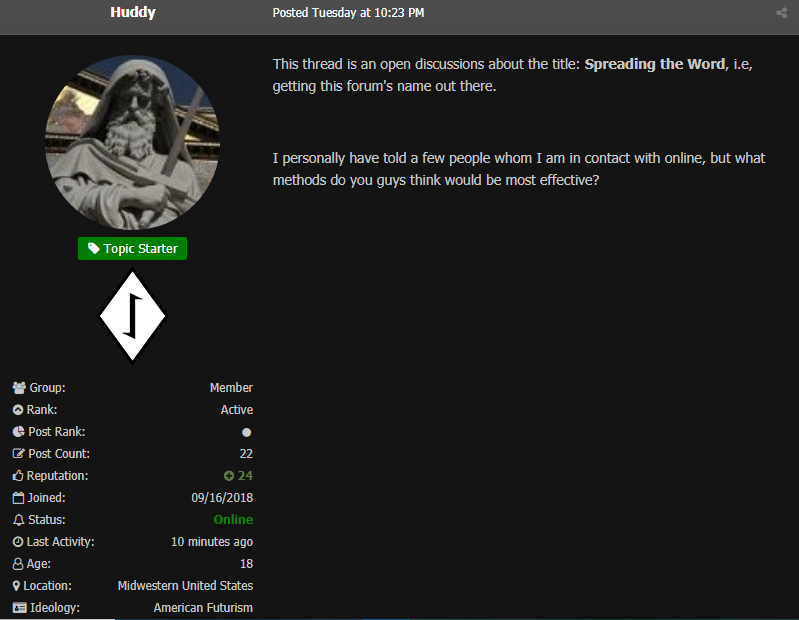 Disclaimer: Clicking on the images will direct you to the forum. 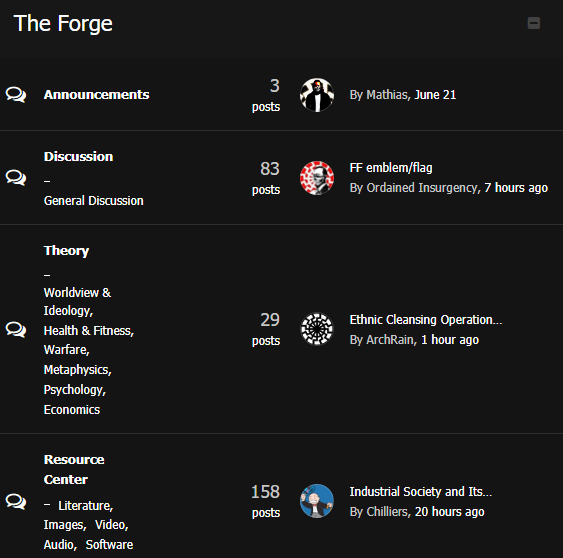 Fascist Forge is composed of two major subforums: “The Crucible,” which hosts their learning center and introduction posts, and “The Forge,” which is divided into four sections: Announcements (members only), Discussion, Theory, and Resource Center. I won’t break down every section of the forum, but I will highlight some of its most interesting — and dangerous — threads. 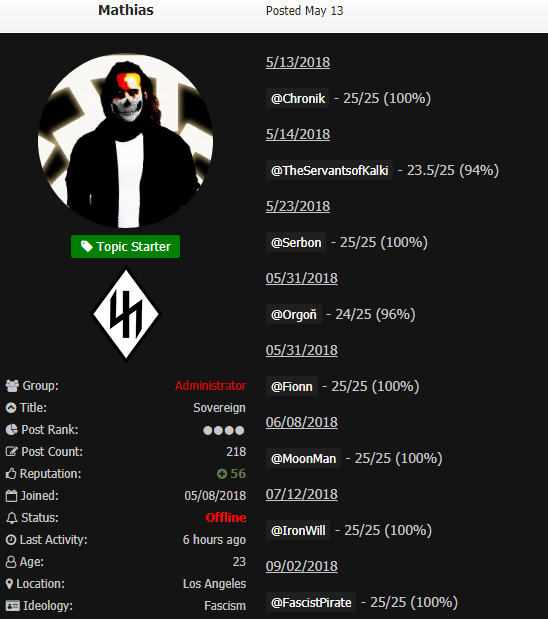 As of today, anyone can create an account on Fascist Forge. However, the first step of FF’s vetting process is introducing oneself to the community. I have gone through all of the introduction posts created up to September 24 and found some interesting information about the FF membership. 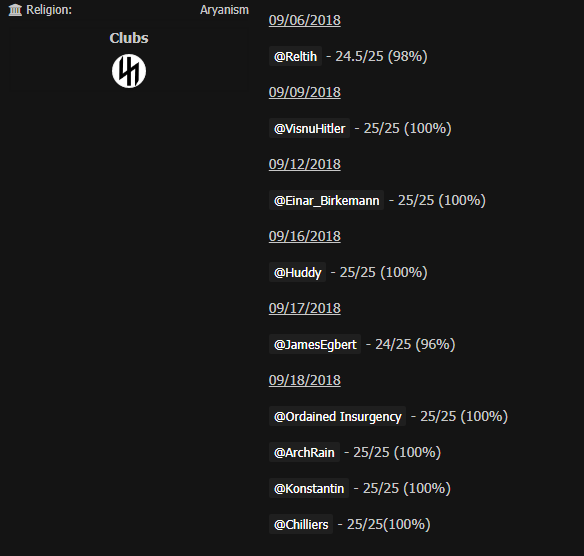 Out of nearly 70 members, only 34 people have introduced themselves. Twenty members (excluding Mathias and D. Aquillius) say they’re located somewhere in the United States. Non-US locales include Australia (3) and the Netherlands (2). One member says they plan on joining the US Navy, while three say they have experience with firearms. One member wrote “military” as one of their skills, but they did not elaborate on this. Fourteen members say they joined Iron March before it was shutdown. 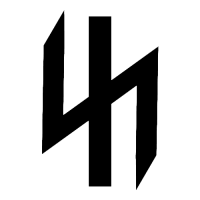 Religions of members include Esoteric Hitlerism (7), Orthodox Christianity (4), Catholicism (2), Paganism (2), Branch Davidianism (1), and Salafi Islam (1). Eight members are under the age of 18 and eleven members (excluding Mathias and D. Aquillius) are at least 18 years old. The youngest member is 14 and the oldest is 31. 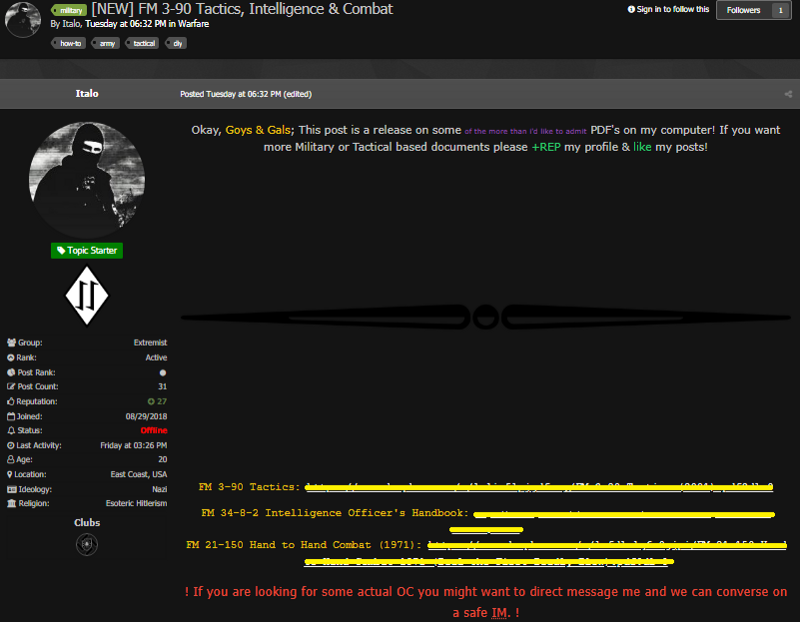 There are at least 3 ‘clubs’ active on the forum: Warpath Division, Legionary Resistance, and Iron Core. I don’t know if these are IRL organizations, but the latter seems to be reserved only for Mathias and D. Aquillius. 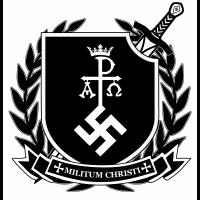 The clubs of Fascist Forge. From left to right: Warpath Division, Legionary Resistance, and Iron Core. To “separate the genuine and devoted from the unfit and incompatible,” Mathias urges members to take a “membership exam” comprised of 25 essay questions. This is the second and last step of the forum’s vetting process. Mathias, in turn, apprises the community of “graduates,” or those who passed the exam with a score of 88% or higher, in a list last updated on September 18. As of September 24, only 17 out of 69 (or about 25%) members have graduated. 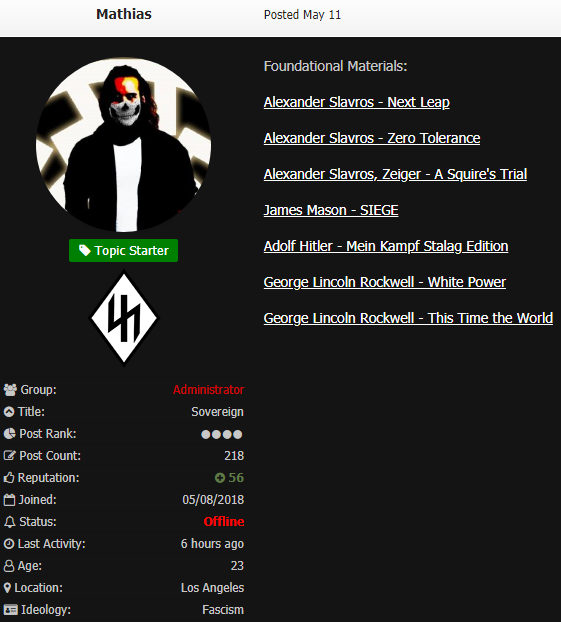 Meanwhile, in the Learning Center, Mathias provides downloadable “foundational materials” by fascist writers like James Mason and Alexander Slavros — one of the founders of Iron March. Literature pieces in this post are hosted on Mega.nz. 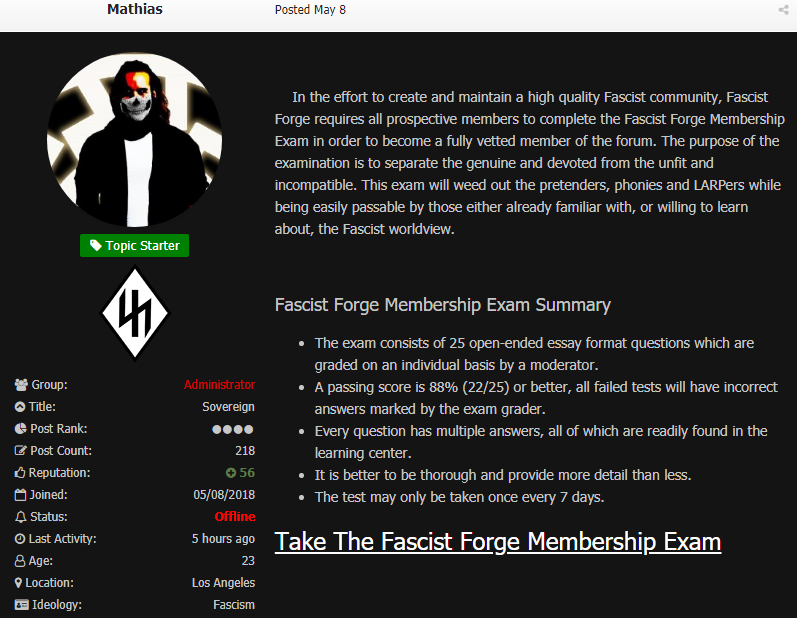 The Forge is the most alarming section of Fascist Forge. As I wrote above, I will highlight some of its most interesting threads. This is the entire post. It’s always good to know how these people go about radicalizing and brainwashing others. 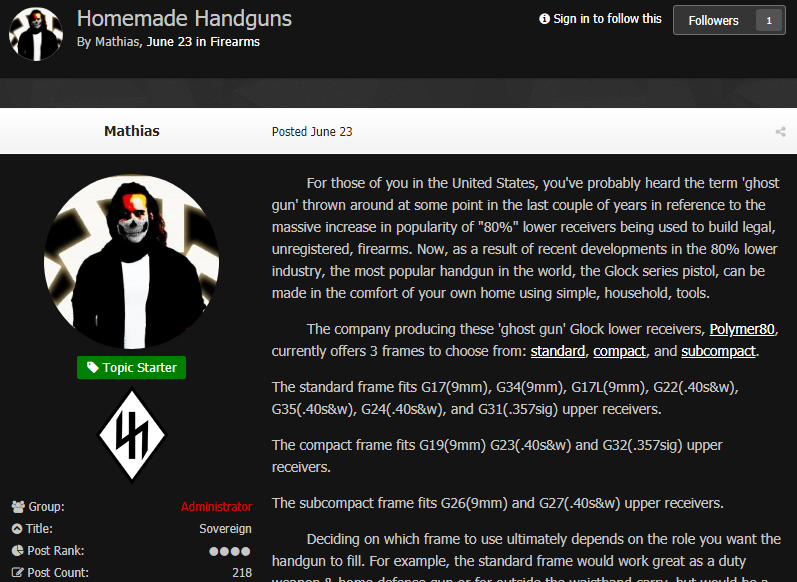 All of the threads contain how-to videos, images, and links to suspicious PDF documents. In September, members discussed propaganda and its role in exacerbating tensions in society. 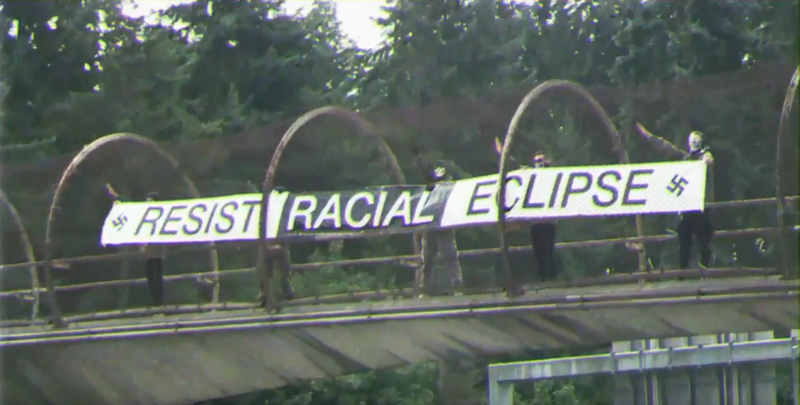 On the left: The “racial eclipse stunt” referred to by Reltih. On the right: Reltih’s first post in the thread. 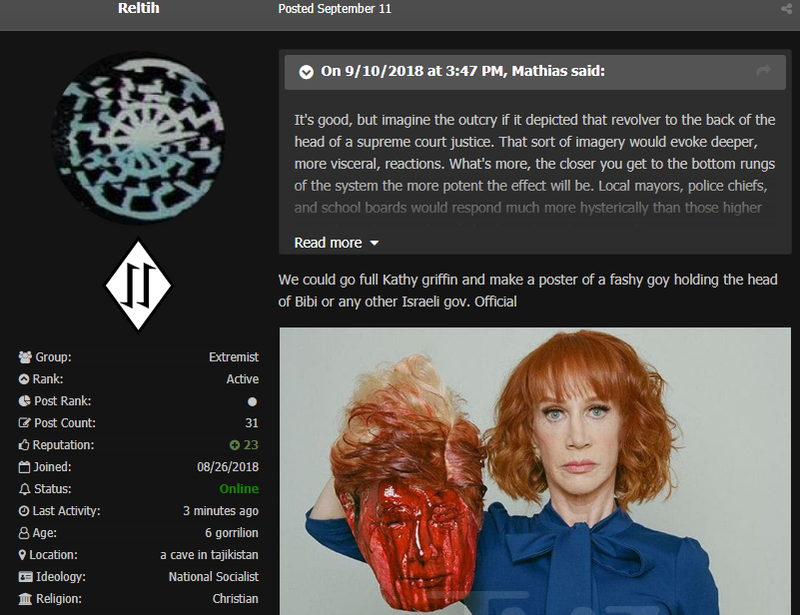 A day later on September 11, Relith suggested they could “go full Kathy Griffin” with the busts of Prime Minister Benjamin Netanyahu and other members of the Israeli government. 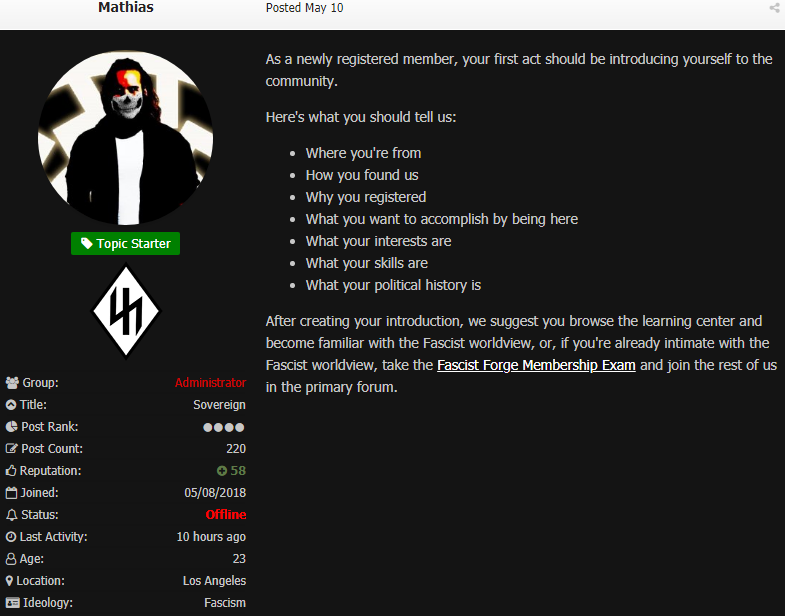 The Resource Center of Fascist Forge. 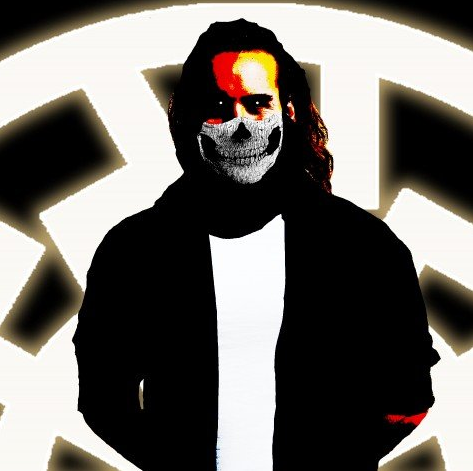 Note Mathias’s obsession with Atomwaffen Division propaganda. 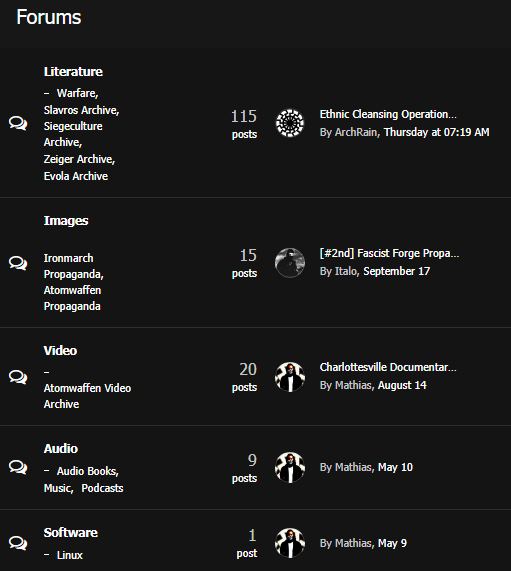 The Resource Center is a cesspool of hate literature, terrorism guides, and visual propaganda of Atomwaffen Division and Iron March. I strongly urge readers not to access the forum — especially the following threads — because it’s likely on a government watch list. As you can see from this graphic, Literature is by far the most populated section of the Resource Center. 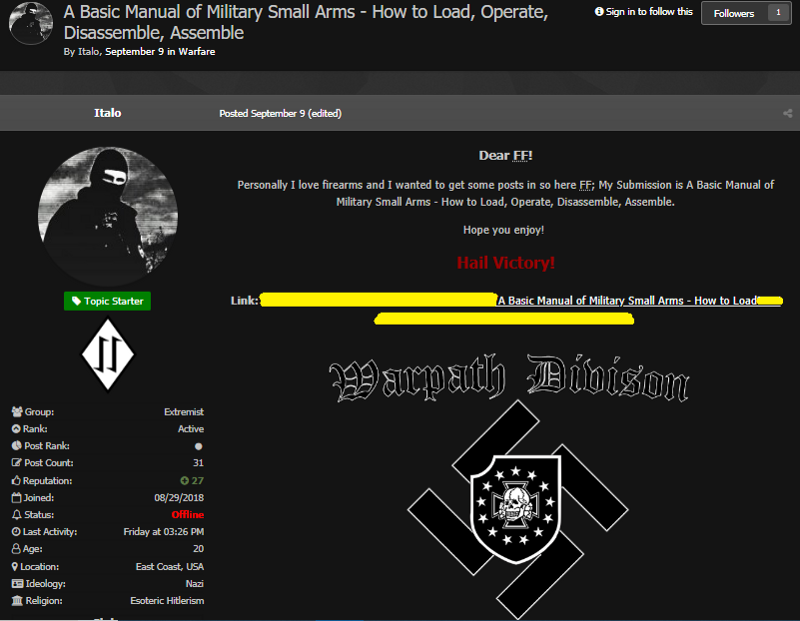 The Warfare section of the center includes posts to an “Al Qaeda Terrorism Manual,” a guide on operating small firearms, and multiple US Army field manuals on intelligence collection and combat. The latter, unfortunately, can also be found on an official US military website — yet another disturbing example of military documents — albeit declassified and produced in 2001 — falling into the hands of potential domestic terrorists. These lunatics don’t need access to the latest manuals from the US military to kill others and wage war against the state. Note the “terror” tag in the top-left corner of the first image. Italo’s intentions are clear. 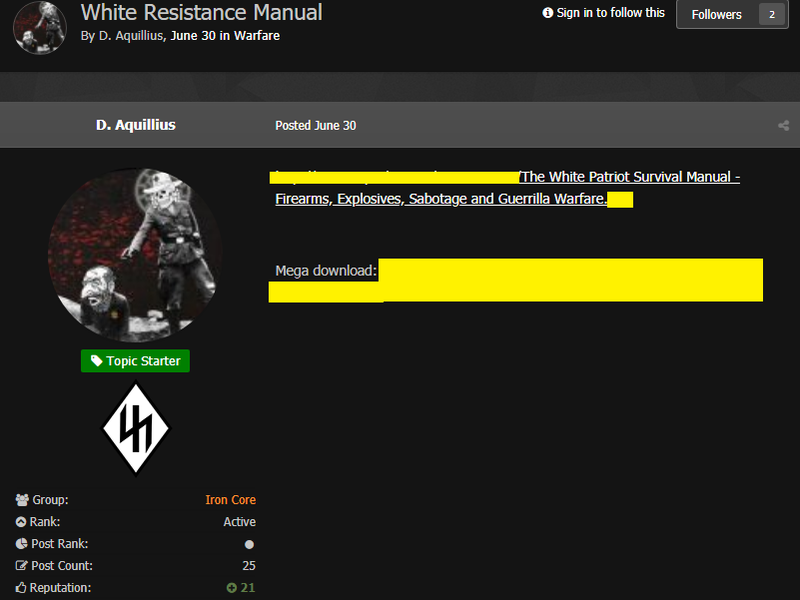 On June 30, D. Aquillius posted a link to a “white resistance manual” hosted on a very dangerous website. The website — which has been on my radar for many months — is rife with guides on creating bombs, firearms, poison, and carrying out assassinations. 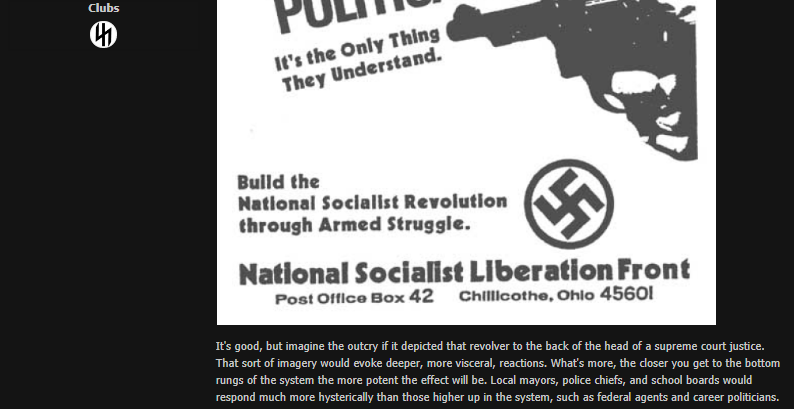 This was originally going to be a (very long) Twitter thread, but after reading more of Fascist Forge’s posts, I decided to present what I found in a Medium article. With that said, I believe the information here can be used to combat fascism online and IRL, especially when countering fascist propaganda and recruitment efforts. I also encourage readers to visit the Google spreadsheet I linked above for more information on the forum’s membership (email for access to spreadsheet). 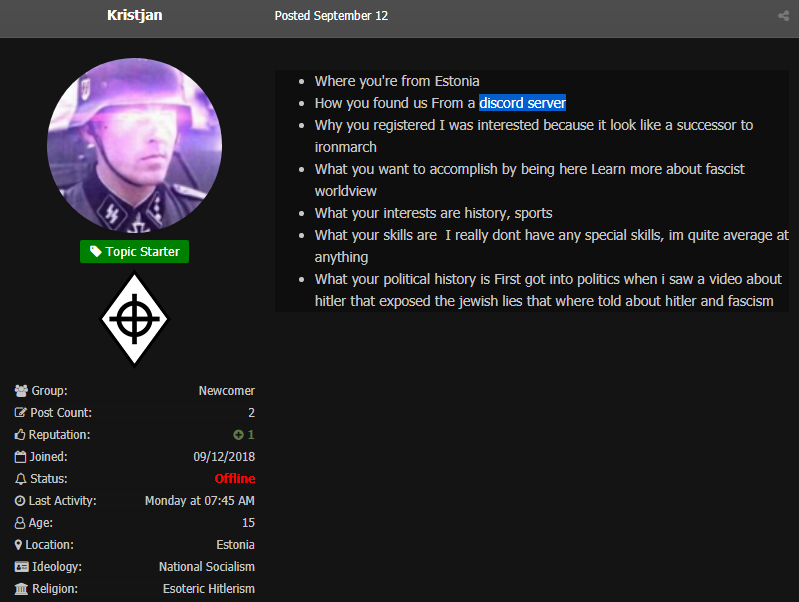 For example, in their introduction posts, most members described how they became fascists, which should be of use to CVE researchers. 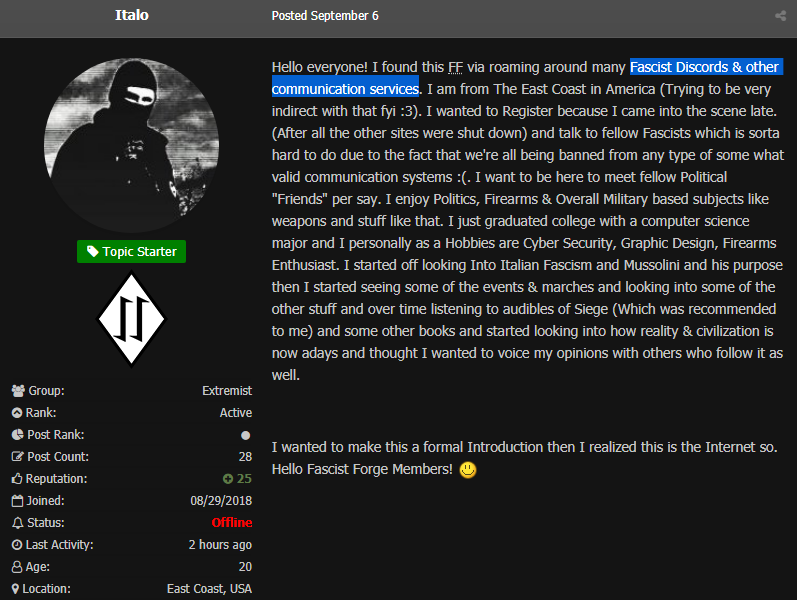 I cannot emphasize enough how much Fascist Forge and its members threaten the public. 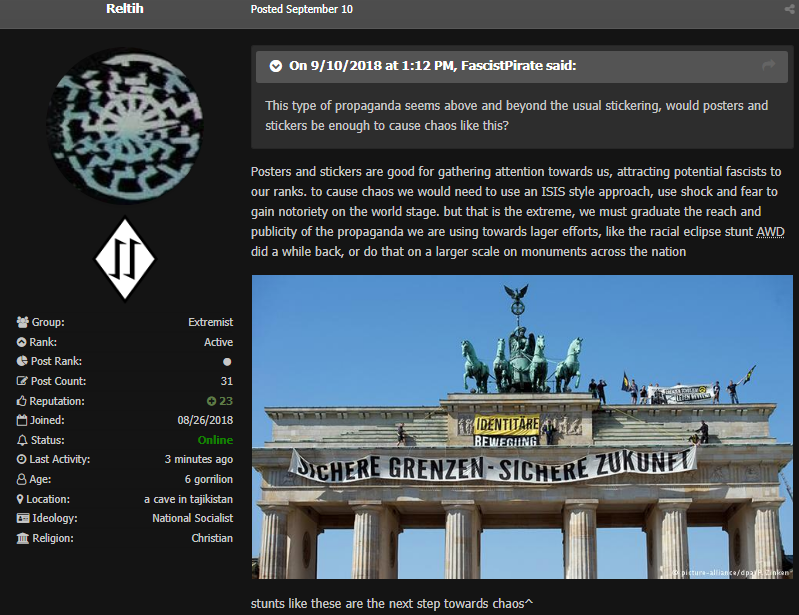 If this turns out to be a competent successor of Iron March, law enforcement officials and activists would do well to keep an eye on this website until its inevitable demise. Thank you for reading, God bless you, and God bless America. American Odyssey is an investigative blog about white supremacy, trolls, and other security issues in the Americas.